A chess player having the FIDE title of International Master (IM or WIM) or International Grandmaster (GM or WGM) should register his/her account and will automatically become a member upon the payment of the membership fee. A player having none of the above mentioned titles may apply for admission. 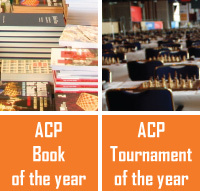 He/She will have to address an application to the ACP Board in order to prove that chess constitutes an important part of his/her professional activity, whether he/she is chess trainers, chess teachers, chess journalists, presidents of chess clubs, etc. This list is not exhaustive. His/Her admission will be submitted to the approval of the Board and, in case of acceptance, he/she will have to pay the annual fee as the other members. We hope that the majority of chess professionals will support our efforts and will join the Association. If you can't afford an ACP Membership or you don't meet requirements described in the ACP Statutes you may still support the ACP by becoming a member of the ACP Club. It is free. To join the ACP Club you only need to register on the ACP Website. Learn more about the ACP membership and fee structure here. An annual membership fee can be paid by money transfer to the ACP bank account or the ACP Paypal account, or by paying directly to one of the members of the ACP Board. By making a money transfer to the ACP Paypal account using the following e-mail address: paypal@chessprofessionals.org. The red fields marked * are obligatory to fill out. By submitting this form, you indicate that you agree to Association of Chess Professionals Terms of Service. Please note that accounts are not activated automatically, so it may take a while before your name will be published on the list of ACP members.